Gemini’s Minnesota™ Letters have the look and feel of cast metal letters so they’re suitable for almost any “up-scale” application. 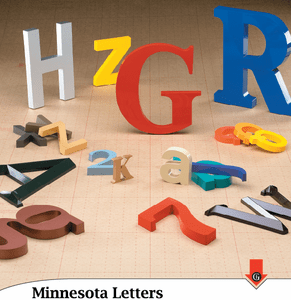 Made from earth-friendly recyclable Cellulose Acetate Butyrate (CAB), Minnesota Letters are beautiful, crisp letters with razor-sharp edges that are easy to install and guaranteed for life. Available in six standard styles and 45 standard colors. More durable than most other plastic letters, they are able to stand up against the scrutiny of indoor applications and tough enough to withstand the elements outside.